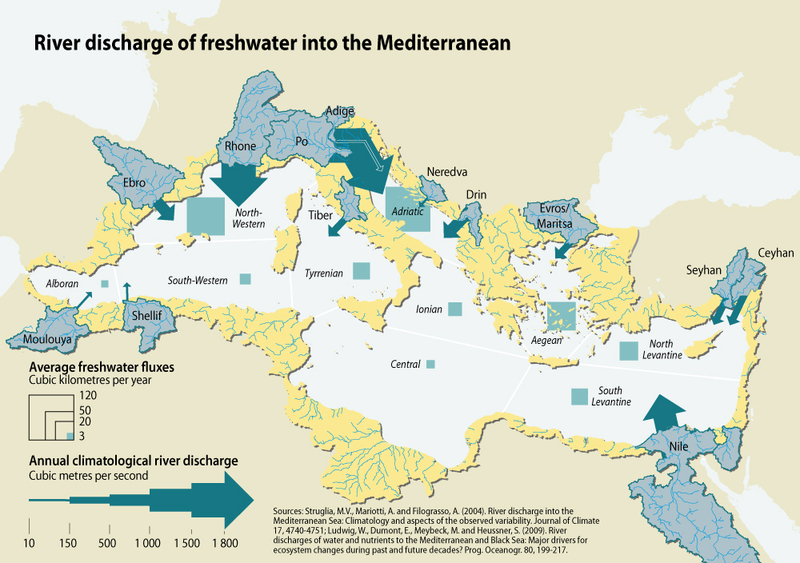 The estimated mean annual river discharge into the Mediterranean for recent years is about 10.000 m3/s, with a dry season in midsummer and a peak flow in early spring (Struglia et al. 2004). Ranked according to annual discharge, the ten largest rivers contributing to the Mediterranean Sea are the Rhone, Po, Drin-Bojana, Nile, Neretva, Ebro, Tiber, Adige, Seyhan, and Ceyhan. These rivers account for half of the mean annual discharge, with the Rhone and the Po alone accounting for already one-third of it (Ludwig et al. 2009). Of the three continents that discharge into the Mediterranean Sea, Europe dominates, with a climatological mean annual discharge that accounts for half of the total. 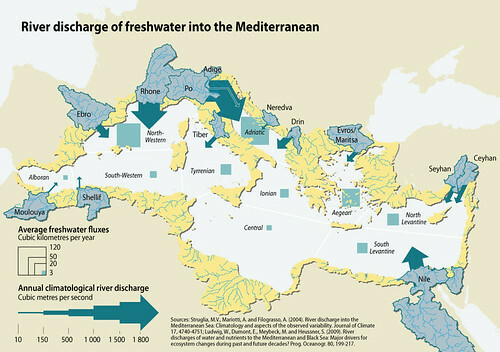 The European discharge clearly determines the seasonal cycle for the Mediterranean. Discharge from Asia and Africa is considerably smaller. Discharge into the Adriatic Sea, the Northwestern Basin, and the Aegean Sea, combined, accounts for 76 % of the whole. About one-third of the total basin discharge flows into the Adriatic (3.700 m3/s) (data from Ludwig et al. 2009). The Nile, with a catchment area an order of magnitude greater than any other Mediterranean river, has a mean annual discharge of 2.800 m3/s to the Aswan Dam. The discharge is reduced to about 5 % of that amount (150 m3/s) by the time it reaches the Mediterranean Sea.